For the record, I wish the article had only discussed vintage fur (as the journalist had implied), as I do not want to seem to support the buying and wearing of contemporary fur in order to follow Hollywood trends. If one is going to wear fur, my point was: BUY VINTAGE. 'Nuff said. WAH, I LOVE SWISH! Well jeal you work there! There was a period where I would walk in on my lunch breaks every day I worked. That hat collection is incredible! 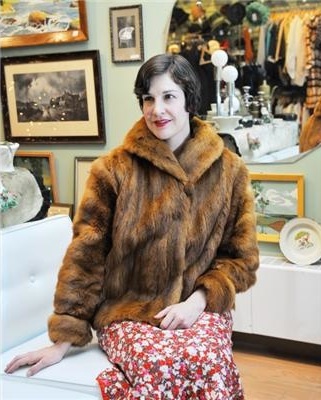 I totally agree that it's only ethical to buy vintage fur. You look so glamorous and timeless in that outfit. What uncanny timing, I was just talking about this very subject with Tony not four hours ago. We both completely agree with you about wearing/buying vintage fur, and we don't support the buying/producing of modern fur, either - especially since there are so many truly excellent synthetics on the market these days. Trappers nowadays are required by law to use instant-kill traps. Modern furs are made from animals who had a far more merciful death than the ones in vintage furs. How is wearing vintage fur, from an animal that probably bled to death in an iron trap, more ethical? If you truly think that trapping animals for fur is wrong, why wear it at all? I enjoyed your commentary in the article the most out of everyone interviewed - most likely because I share you view. Also, Swish is such a delightful store!